Progressive’s latest financial report showed profits and revenue growing by leaps and bounds, although those numbers were affected by the one-time liquidation of hundreds of millions of dollars in its stock portfolio. As a result of the revenue jump, profits rose by a colossal $119 million for a 529 percent increase compared with August 2011. Security gains also showed a huge uptick—again, affected by the liquidation—rebounding from a $35.7 million loss in August 2011 to a $141.9 million gain last month. The insurance provider also continued writing more business, posting a 5.6 percent jump in personal auto policies in force during August 2012 compared with the same month last year. 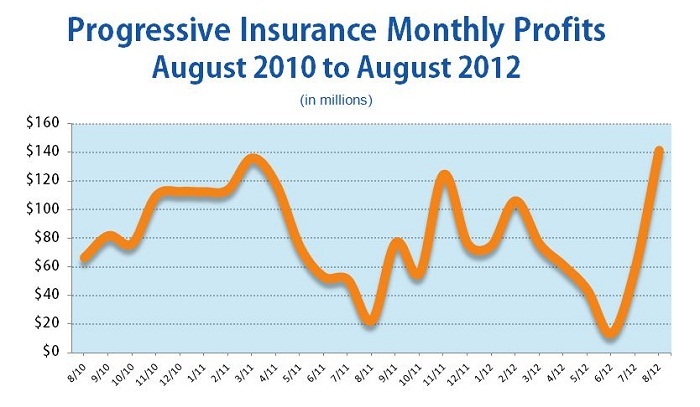 The insurer’s catastrophe-related losses also dropped this month compared with August 2011. A vast 90 percent of the $20 million in losses incurred in August 2012 was due to the Gulf Coast’s Hurricane Isaac. Last year during August, the insurer incurred $37 million in catastrophe losses. The amount Progressive spent on loss and loss adjustment expenses overall still grew compared with last year, spiking 9 percent to come in at $945.2 million for August. The insurer posted a 29 percent drop in first-quarter profits compared with the same period last year; the slide continued in the second quarter with a 51 percent decrease in profits compared with 2011. Prompted by the gloomy outlook from those two quarters, CEO Glenn Renwick called the insurance company’s performance “disappointing” in his last quarterly letter to shareholders. He also said a “diagnosis and treatment plan” boded well for the insurer’s future finances. Last month, Progressive reported year-over-year increases of 15 percent in profits and 10 percent in revenues. Renwick said the insurance carrier plans an expansion of Snapshot, its usage-based insurance program (UBI), which is already the most widely available UBI program in the U.S. Progressive’s UBI expansion plans coincide with a busy year for the specialized coverage type, which involves installation of an in-car device that records driving habits on which possible discounts are provided for safer behavior behind the wheel. In July, Esurance launched its first UBI offering, called DriveSense, in Texas. The insurer partnered with Sprint, leveraging the telecommunications company’s wireless network to pilot-test DriveSense. That month, Sprint announced that it would make its wireless network available to all insurers wanting to test their own UBI program. A mainstay on lists of best car insurers, Progressive is locked in a tight race with other companies for top spots in market share. According to the most recent data from the National Association of Insurance Commissioners (NAIC), while State Farm has long been the leader in market share for U.S. auto insurers, with 18.6 percent of the market, the margins are much tighter between Allstate, GEICO and Progressive, which have 10.3, 9.1 and 7.9 percent of the market, respectively.